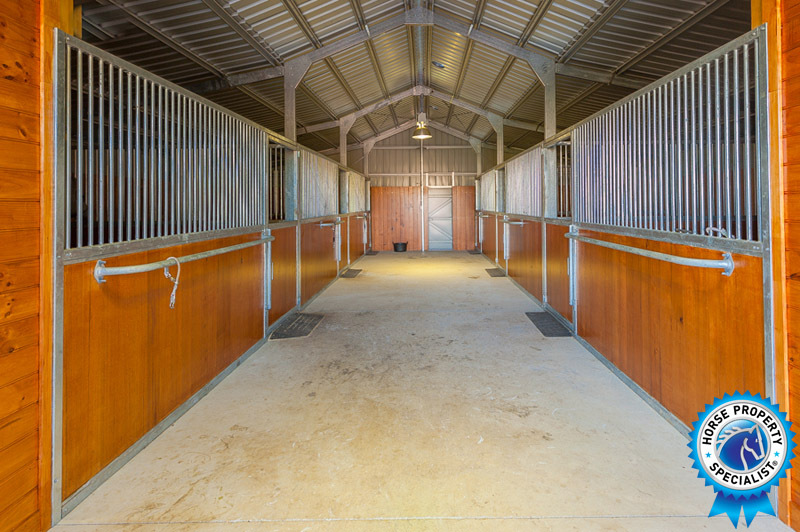 For the equestrian community, here is a rare opportunity to purchase luxurious living for you AND your horses! This stunning lifestyle property is also fully set up to carry cattle. The eye-catching architecturally designed, 2-storey home, finished in 2014, is distinguishable as an American Hamptons style home. It has been strategically situated on an elevated site to take in the picturesque valley views. The Master Builder owner has constructed and completed the build to the highest specifications. The design of the home flows beautifully, with striking views from every window. The home has Hebel panel walls, with its excellent insulation capacity, rendered with rock coat tough render. The house has a 7-star energy rating and comes complete with solar power. 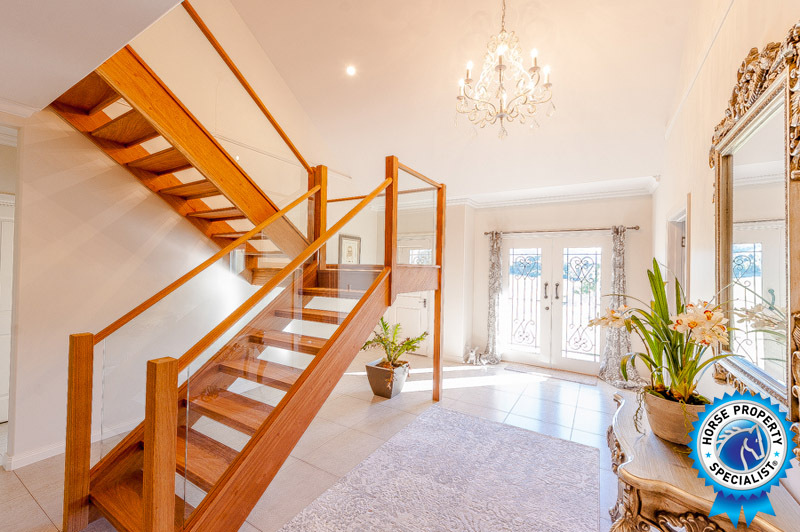 The Wow Factor begins as you enter through the grand entry foyer with a regal chandelier and a sweeping solid timber and glass staircase. The kitchen, dining and family area are the hub of the home, typical of the American Hamptons style living. Solid granite benchtops and an enormous island are complimented by the high-end kitchen appliances. No country kitchen can be without a butlers pantry and this one is impeccable. Imported Italian tiles are features of the kitchen and utility room. Convenient access to the kitchen from the 3 car garage is by way of the utility room. French doors and timber windows are in white, in keeping with the American Hampton style living. The impressive superbly appointed media/living room with a wall-sized cinema screen for home theatre viewing leads off of the foyer, past the office. The master bedroom, on the ground floor, is a sizeable 8 m x 5 m room, with its own parent retreat. Off of the master bedroom is a spacious ensuite with dual sinks, double glass shower, with his and hers walk-in robes. The upstairs includes 3 double bedrooms with BIRs, a generous-sized lounge and family bathroom. The newly completed in ground swimming pool further enhances the luxury lifestyle and will be a welcome place to retreat to during the summer months. The cabin is made of solid timber slabs, giving it a distinctive rustic charm. 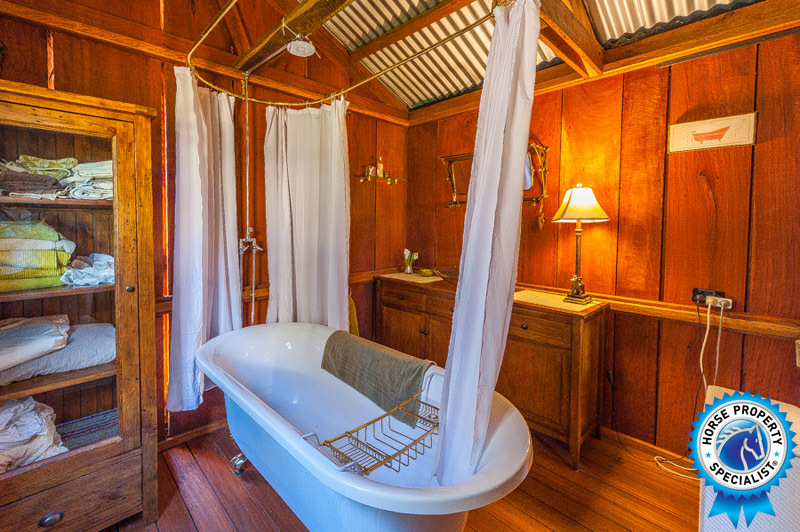 It has a fully equipped kitchen and a timber bathroom with a shower and claw foot bath. The 2 bedrooms, plus an open style family living and dining room offer a warm comfortable feel. The barn has a wide breezeway with 6, 4m x 4m stables. The interior of the elite style stables have rubber flooring which are finished in Tasmanian oak. There is a fitted out tack room and large feed room, with a mandatory hot wash tie up area outside. There are 12 paddocks with horse-safe fencing with electric hot wire. Two paddocks have shelters. The riding arena and metal lunge yard are excellent for exercising the horses. Laneways that surround the property can also be used. One very large paddock is ideal for your prize cattle. Included are cattle yards with a crush and loading ramp. Several sheds and garages have been designed for storage and machinery and there is a full height shed for the horse truck. Six large water tanks with pumps provide water to all the paddocks.